Just yesterday, I finally finished this buffet/dresser and it is ready for Etsy! 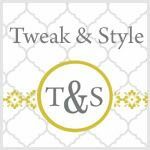 Although I used Annie Sloan Duck Egg Blue paint, I added a little twist by doing some gold metallic underneath....for a little glam! After some heavier distressing, the real wood and the softer metallic comes through, giving it a nice little variation. For this finish, I start with a primer and metallic base coat that is painted on sporadically, randomly or artsy fartsy...however you like to look at it. You do not cover the piece completely because you also want the original finish to show through. First, basecoat with a primer tinted to gold color. I used Sherwin Williams ProBlock tinted to a manual color. Take your paint brush and cover about 70% of the piece with the primer. 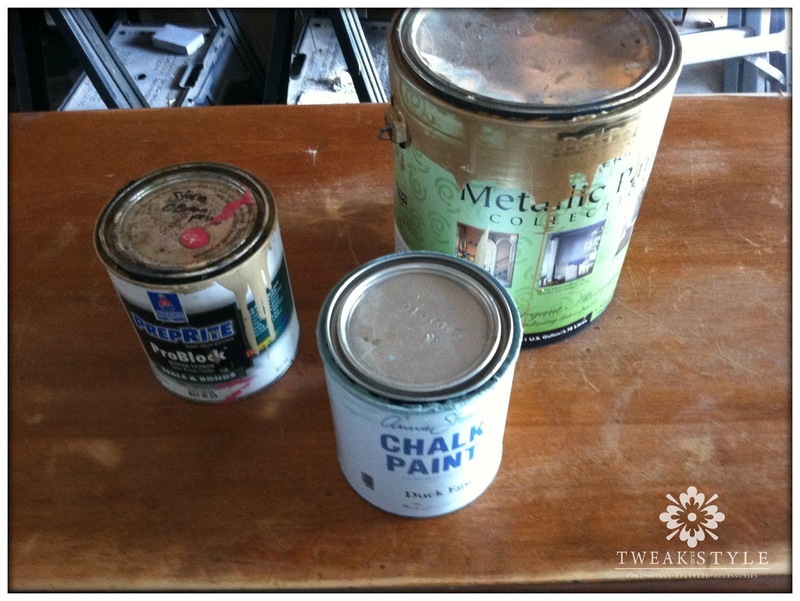 Now cover all the areas with primer with the metallic. This doesn't have to be neat. I used Modern Masters in Pale Gold, one of my favorite golds, ever. We don't want to bring on the bling too much. Just make sure to brush out your strokes so you don't leave ridges and lap lines where the paint is!! Using, Annie Sloan Duck Egg Blue Chalk paint, paint the piece, but do not cover completely. without so much sanding which would remove some of the gold. You could also use something under the blue to resist like wax but this gives me better control. 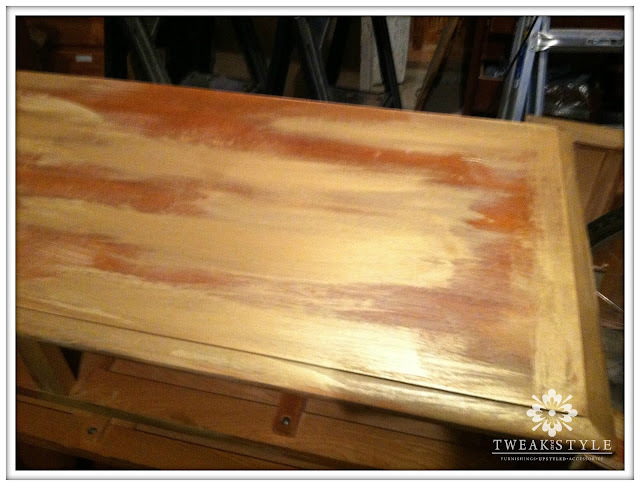 Paint your second coat of chalk paint continuing to leave some gold and wood exposed. 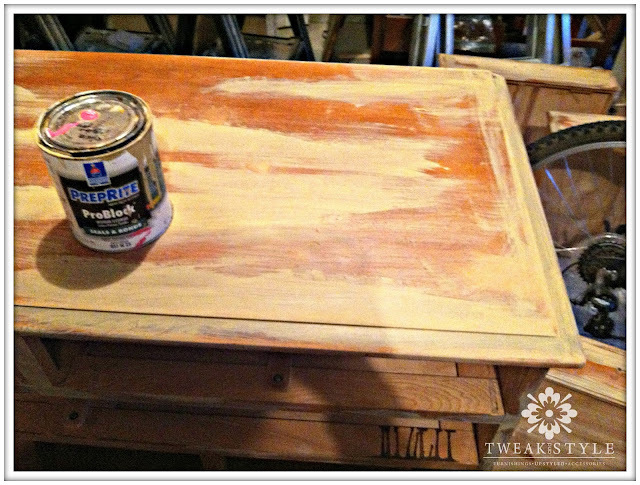 you can distress with 100 grit sand paper, concentrating on edges and places where furniture would naturally age. 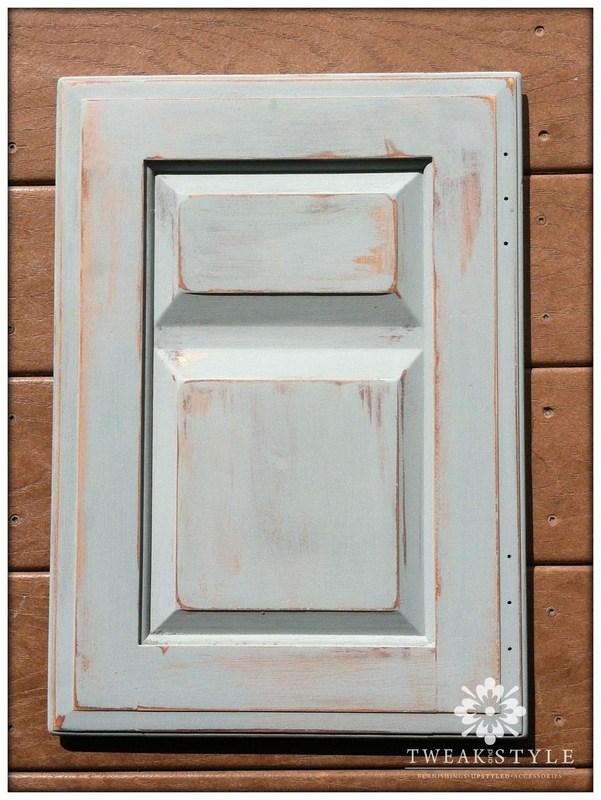 Here is the door before the last step, waxing with plain and then dark wax. all of the depth really comes out. Wow this turned out so beautiful! I love the gold tone under the blue, Elegant and understated glamour, for sure. 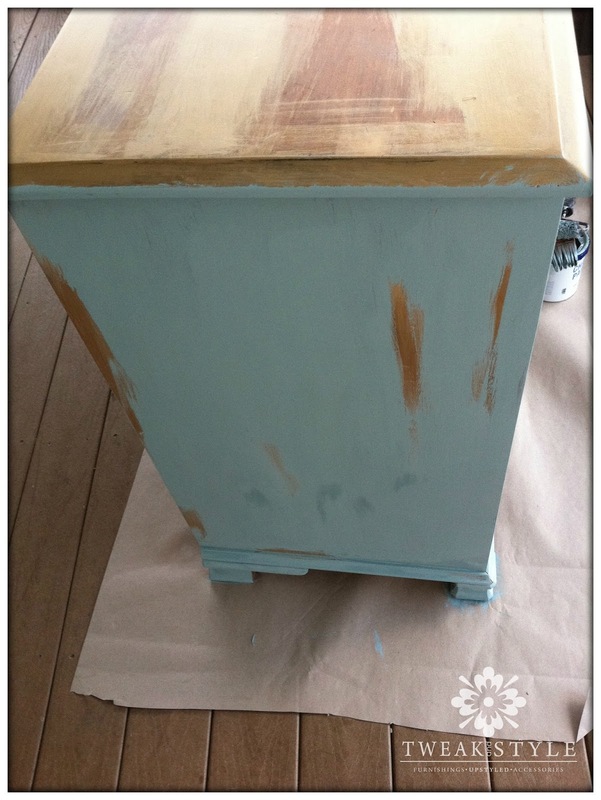 (I'd love to do the same to my bedroom dressers (gold undertone, black top coat). Great job! Love this - beautiful job! turned out perfect! 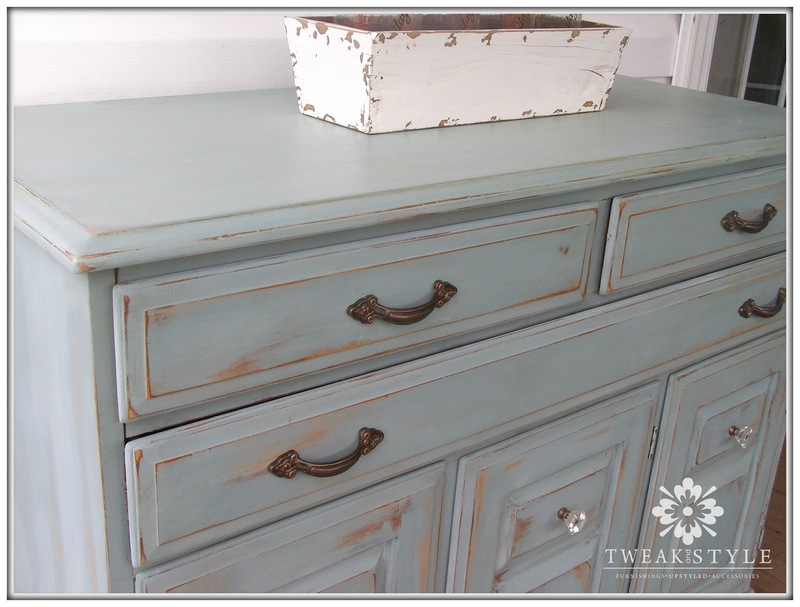 love duck egg blue, especially with the distressing!! this is gorgeous! 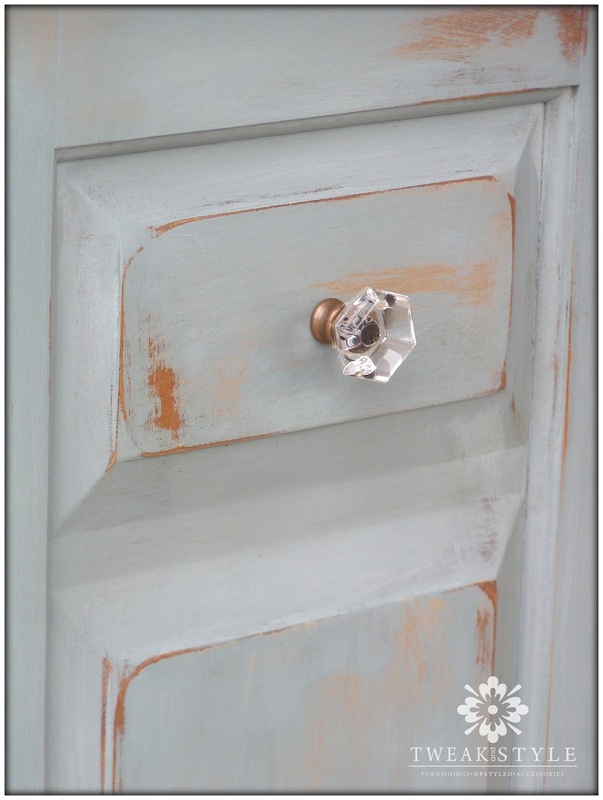 love the color and distressing! What a lovely piece. It is stunning. 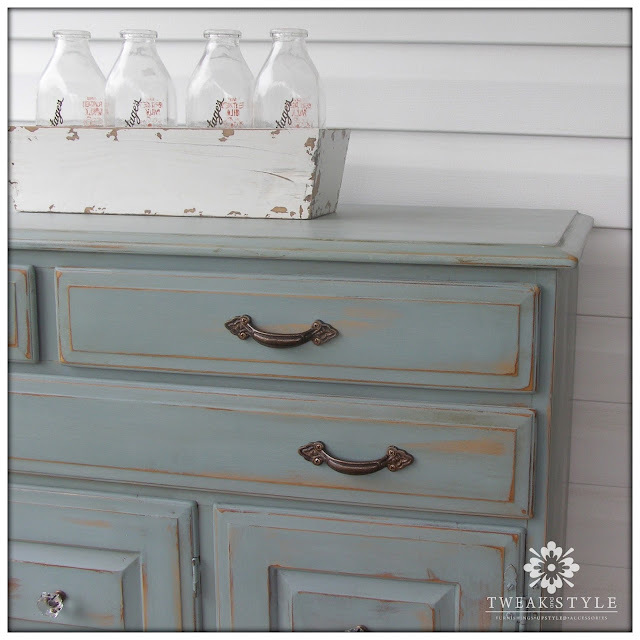 This is quite possibly the best piece of furniture I've ever seen done with AS chalk paint! 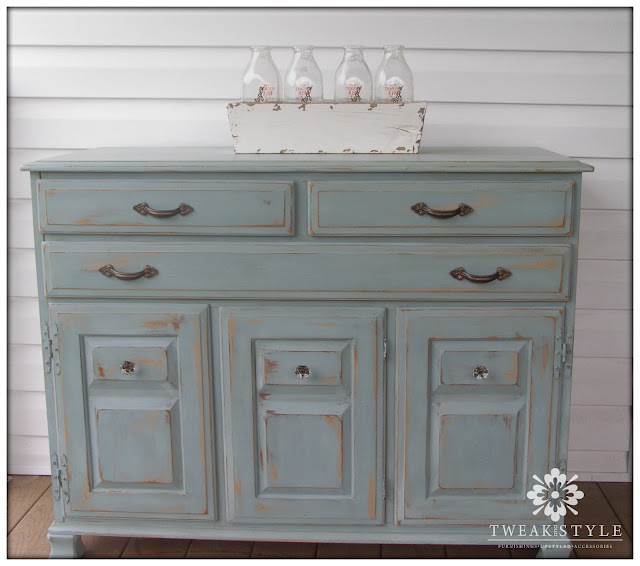 I am already trying to figure out what piece of furniture I am going to try this out on! LOVE it!